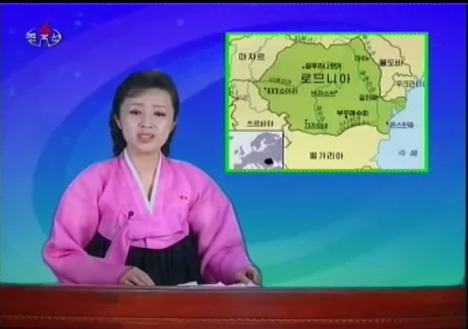 North Korea’s state broadcaster, Korea Central Television, has given its evening news a new look. The changes are small, but represent a leap forward in presentation style for the staid broadcaster. The new look has news readers presenting items in front of a computer-generated background. A graphic to accompany the story appears above the right or left shoulder — a style almost universally used in other countries. When the report begins the graphic moves forward to fill the screen. Here are a couple of images from the Saturday March 10, 2012, evening’s news, which was the first seen with the changes. The report above covered the publishing in Romania of Kim Jong Il’s “Juche Philosophy is Unique Revolutionary Philosophy” book. And here’s a report on the reaction of workers at Pyongyang Block Plant after hearing a statement from the KPA Supreme Command denouncing South Korean President Lee Myung Bak. 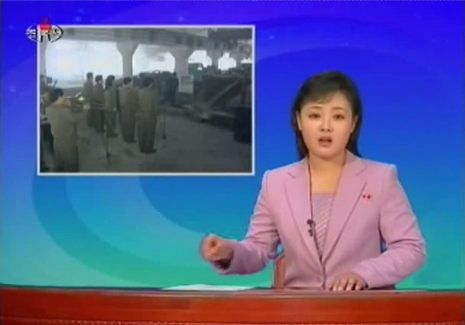 Until Saturday, KCTV typically alternated between either a wooden background or paintings of Pyongyang. The painting could be seen when Chinese Central Television was given rare access to the KCTV news studio as part of its Lunar New Year broadcasts this year. So the switch to a computerized backdrop is quite a jump for the broadcaster. The main evening news remains on air at 8pm local time each night.